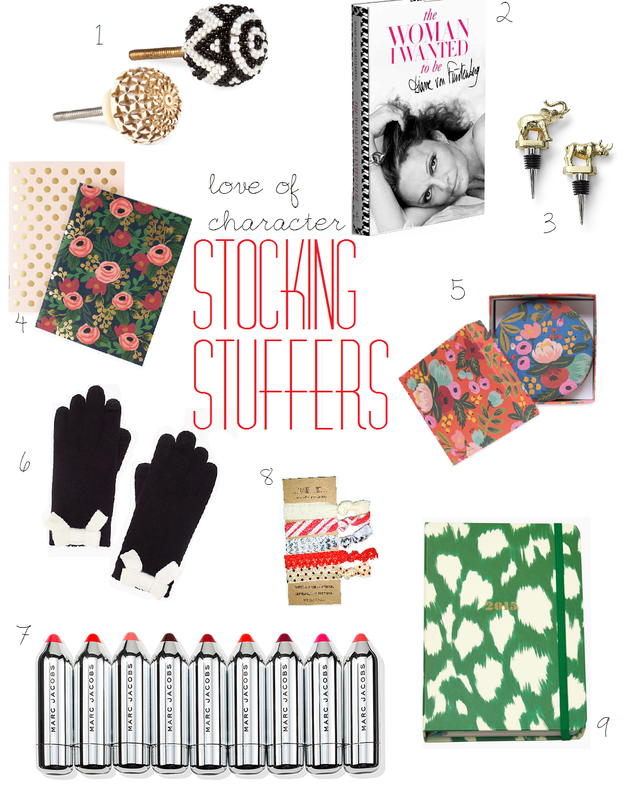 For the Love of Character: LOC Stocking Stuffers 2014! 2. Diane Von Furstenburg is one of my fashion icons and I really hope someone puts The Woman I Wanted to be in my stocking this year! She has led quite the life and is truly an inspiration. 3. Everyone loves a fun wine stopper and I look how pretty these Safari Bottle Stoppers from C Wonder are! 4.|5. Surprise, surprise, I have Rifle Paper Co. options in here. Their pocket notebooks and floral coasters are gorgeous pops of color for any stocking. 6. Gloves that are texting friendly are the best! When they are as cute as these Kate Spade Bow Gloves, they are perfect for a stocking! 7. Marc Jacobs is a favorite designer of mine and when I saw these Kiss Pop Lip Color Sticks, I decided this would be my stocking lip choice for the year. 8. I know it's a personal plug, but I really do think the Love of Character Hair Ties would make a great item to throw in a stocking! You can do the fun Christmas edition or one of the other great packs. Details below. 9. I love the Kate Spade Planners and this year I'm craving this small green one! I need to get my schedule more organized and I love that she has smaller sizes that are more purse friendly this year. Don't forget that a lot of these websites are having sales - check out my post from yesterday to see the list. E-mail me at fortheloveofcharacter@gmail.com or Facebook message me! I am also going to work on fun Little Boxes of Christmas Character today and will post about them next week!